ROUND ROCK, Texas -- The suspect in the deadly string of bombings that terrorized Austin blew himself up early Wednesday as authorities closed in on him, bringing a grisly end to the three-week manhunt. But police warned that there might be more bombs still out there. Authorities identified the suspect as a 24-year-old Mark Anthony Conditt and said his motive remained a mystery, along with whether he acted alone in the five bombings in Texas' capital and suburban San Antonio that killed two people and wounded four others. 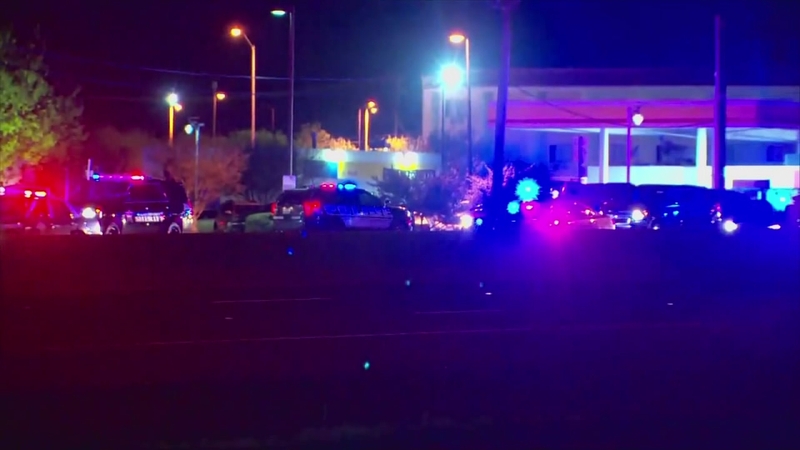 Authorities had zeroed in on the man in the last 24 to 36 hours and located his vehicle at a hotel on Interstate 35 in the suburb of Round Rock, Austin Police Chief Brian Manley said at a news conference. They were waiting for ballistic vehicles to arrive to move in for an arrest when his vehicle began to drive away, Manley said. Authorities followed the vehicle, which ran into a ditch on the side of the road, he said. When members of the SWAT team approached, the suspect detonated an explosive device inside the vehicle, the police chief said. The blast knocked back one officer, while a second officer fired his weapon, Manley said. Austin has been targeted by four package bombings since March 2. A fifth parcel bomb detonated at a FedEx distribution center near San Antonio early Tuesday. Citing a high-ranking law enforcement official, the Austin American-Statesman reported that authorities had identified the suspect based largely on information, including security video, gleaned after he sent an explosive device from an Austin-area FedEx store. Authorities on Wednesday warned of the possibility that more bombs had yet to be found. "We don't know where this suspect has spent his last 24 hours and therefore we still need to remain vigilant to ensure that no other packages or devices have been left to the community," Manley said. Manley said the suspect is believed to be responsible for all the major Austin bombings. Authorities had initially believed the bombings may be hate crimes because the victims of the earliest blasts were black, but they backed off that theory after Hispanic and white victims from different parts of the city were also affected. Fred Milanowski, an agent with the U.S. Bureau of Alcohol, Tobacco, Firearms and Explosives, said it was "hard to say" if the bombing suspect had acted alone. "What we do know is we believe the same person built each one of these devices," said Milanowski, the agent in charge of the Houston division of the ATF. "We are not 100 percent convinced there's not other devices out there." Asked if the suspect built bombs before the Austin attacks, Milanowski said: "We know when he bought some of the components. It's hard to say whether he was building along the way." Austin Mayor Steve Adler thanked law enforcement for their work in bringing down the suspect and urged residents to continue to report anything that appeared suspicious or out of place. "We're just really relieved and just incredibly thankful for this army of law enforcement that has been in our community here for the last week or so," he said on NBC's "Today" show. "We're asking people to remain vigilant and still identify things in the community that seem suspicious or out of place, as we have been doing." Isaac Figueroa, 26, said he and his brother heard sirens and helicopters early Wednesday in the area and drove toward them, then cut through nearby woods on foot after they hit a police roadblock. Figueroa said they saw a silver or gray Jeep Cherokee that was pinned between black and white vehicles and "looked like it had been rammed off the road." He said he saw police deploy a robot to go examine the Jeep. President Donald Trump, who had earlier said whoever was responsible for the Austin bombings was "obviously a very sick individual or individuals," tweeted, "AUSTIN BOMBING SUSPECT IS DEAD. Great job by law enforcement and all concerned!" The suspect's death followed a day of rapid-fire developments in the case. On Tuesday, a bomb inside a package exploded around 1 a.m. as it passed along a conveyer belt at a FedEx shipping center in Schertz, northeast of San Antonio and about 60 miles (95 kilometers) southwest of Austin. One worker reported ringing in her ears and was treated at the scene. Later in the morning, police sent a bomb squad to a FedEx facility outside the Austin airport to check on a suspicious package. Federal agencies and police later said that package had indeed contained an explosive that was successfully intercepted and that it, too, was tied to the other bombings. The Schertz blast came two days after a bombing wounded two men Sunday night in a quiet Austin neighborhood about 3 miles (5 kilometers) from the FedEx store. It was triggered by a nearly invisible tripwire, suggesting a "higher level of sophistication" than agents saw in three package bombs previously left on doorsteps, Milanowski said. Authorities have not identified the two men who were hurt Sunday, saying only that they are in their 20s. But William Grote told The Associated Press that his grandson was one of them and that he had what appeared to be nails embedded in his knees. Law enforcement had a scare Tuesday night at a Goodwill store in southern Austin, where someone had dropped off a device sometimes used in military training and it went off, injuring a worker. Authorities don't believe it was the work of the bomber or a copycat. They said such military items are occasionally donated to Goodwill instead of being disposed of properly.